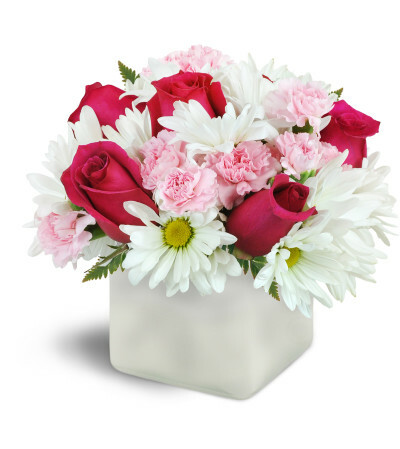 Vibrant fuchsia roses are delightfully complemented by soft pink mini carnations and sweet white daisies for an ever so charming treat! It's a winning combination for any occasion! 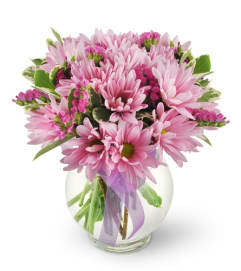 Hot pink roses are arranged with pastel pink mini carnations and white daisies in a modern glass cube vase. The flowers were lovely, arrived on time and Ann was delighted with them. Thank you so much!! 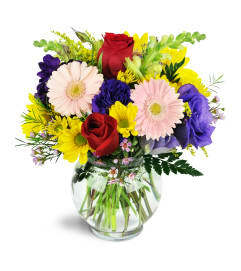 Rhea Flower Shop is a Lovingly Florist in Etobicoke. Buying local matters. Discover how Lovingly supports local florists. Copyrighted images herein are used with permission by Rhea Flower Shop.